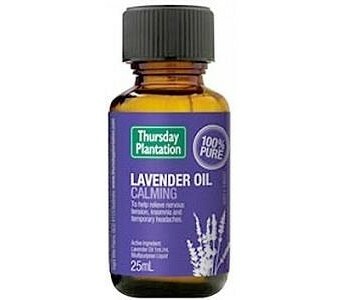 Lavender is one of the most nostalgic fragrances in the world and has many uses. Our 100% Pure Lavender Essential Oil is naturally sourced and can be used as a vapouriser or applied directly on the body. Adults Only: To help relieve nervous tension, insomnia and give temporary relief of headaches - Massage: 5 drops (1/4mL) to 10mL carrier oil. Apply to temples, forehead, back of neck, shoulders or full body. Vapourisation: 5 drops (1/4mL) in water in oil burner. Bath: 5 drops (1/4mL) in bath water For the relief of symptoms of eczema - Direct application: Dilute 5 drops (1/4mL) to 10mL carrier oil For relief from tick, wasp and insect bites - Dab undiluted onto affected area CAUTIONS AND CONTRAINDICATIONS Always read the label. Use only as directed. It is recommended you skin patch test prior to use. If irritation occurs discontinue use. If symptoms persist consult your healthcare practitioner. These claims are based on traditional aromatherapy.